Graduation days always call for a celebration, and why shouldn’t it be? It’s a day to celebrate the accomplishments of a person after years of studying, building up knowledge that can be used for their career, and to learn how to go through with life. Also, during graduation days, one chapter of a person’s life closes, and another chapter opens, and this is why graduations are always worth celebrating. 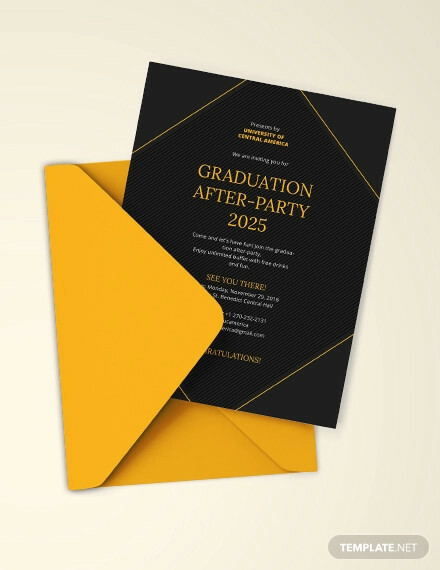 On this page, we have an entire gallery of some of the best and most visually appealing, formal invitation designs that can be used to invite people to graduation celebrations, whether it’s the after-party or the ceremony itself. These designs may come in very useful if you are in need of a more formal way of notifying people to come to your memorable event. To see the designs yourself, go ahead and start scrolling down. 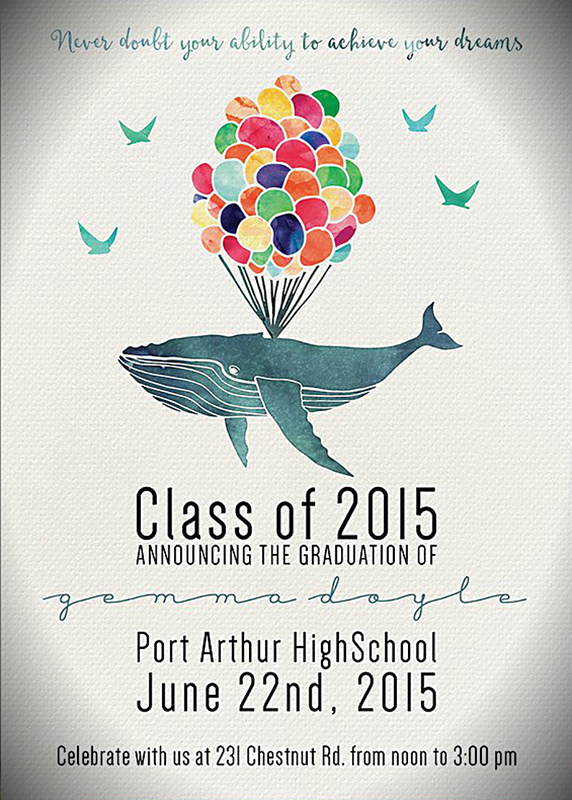 Check out this very artistic graduation invitation card design. It shows an illustration of a blue whale being lifted up in the air by balloons. This illustration may not be easy to interpret, considering how symbolic it is. But one thing’s for sure, a tremendous amount of effort has been exerted to make this design since it seems both hand-drawn and hand-colored. 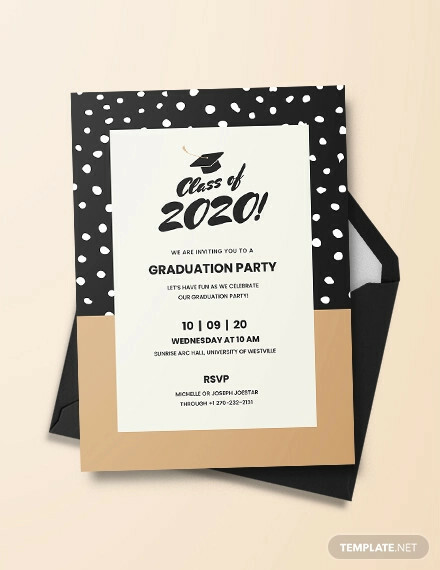 Go ahead and download this event invitation design if you’re not afraid of being creative and abstract on your graduation invitations. 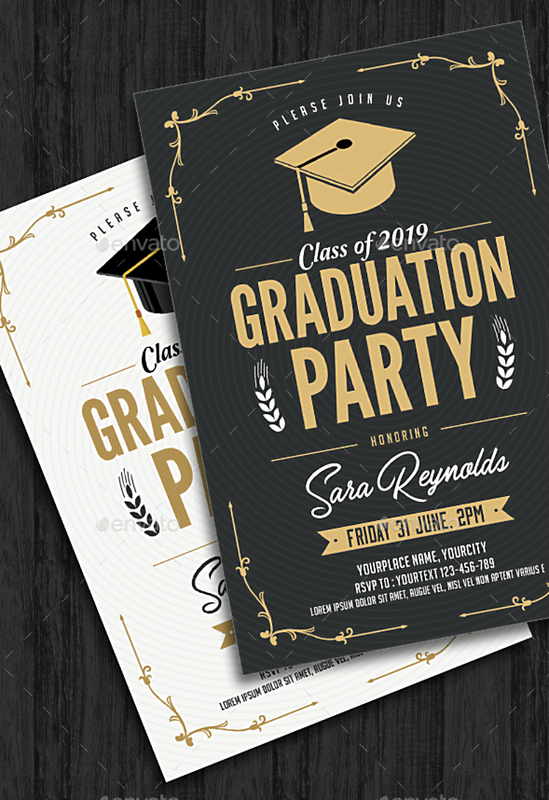 When making your graduation invitation, if you want to make the most on the space provided for you, then why don’t you give this design a try? 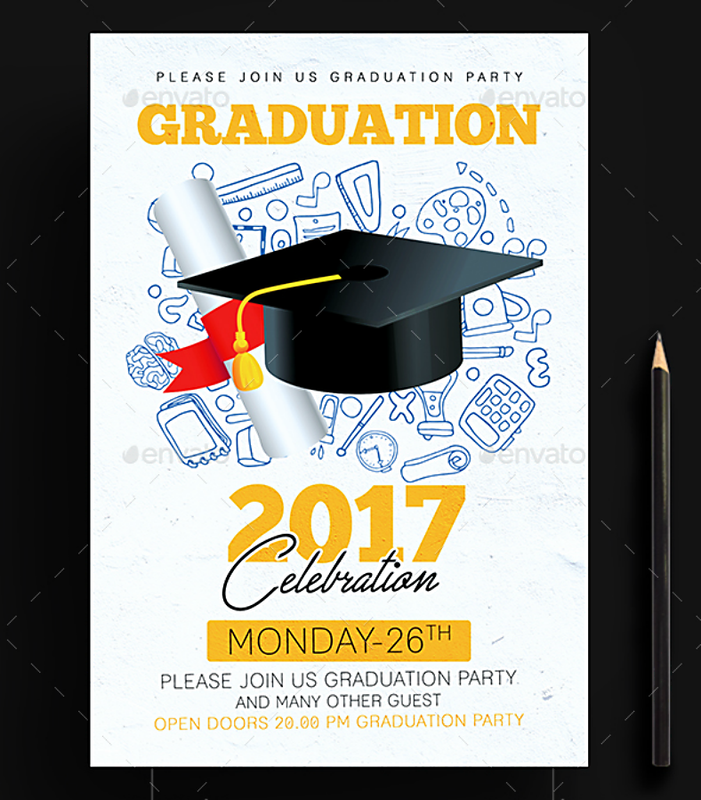 It’s got all the elements necessary for a graduation party invitation, with a few additional features to help enhance the quality even more. Even with all these elements placed on the design, it doesn’t appear cluttered because the elements are being arranged in a way that there is still enough blank spaces to make it look neat and organized. 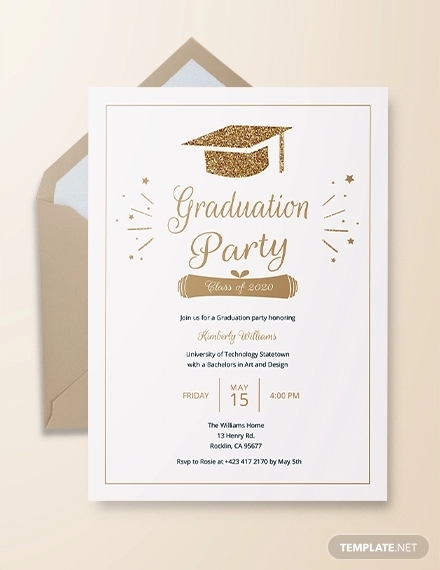 Here is another creative graduation party invitation design that is full of elements but is still able to prevent itself from looking cluttered. 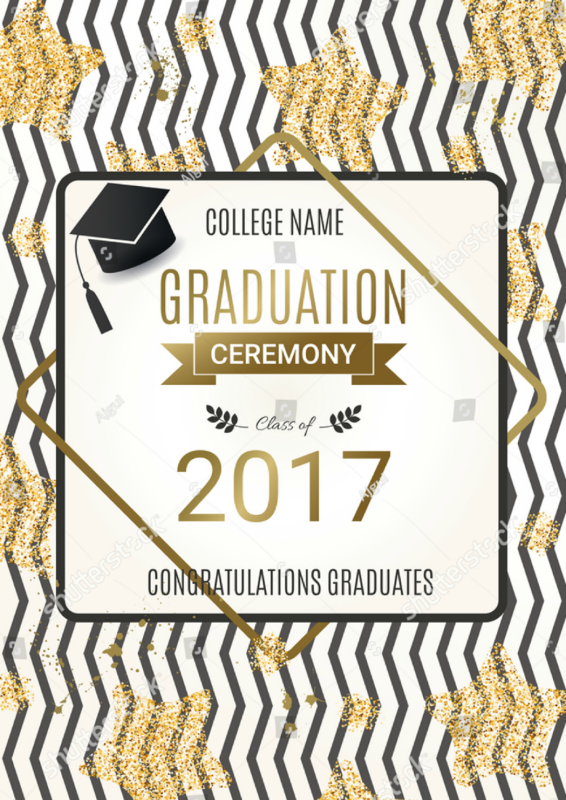 This design contains an image of an academic or graduation cap and a diploma over an illustration of different school materials. What’s wonderful about this design is that the way the elements are being presented, the design looks layered giving it an three-dimensional appearance. 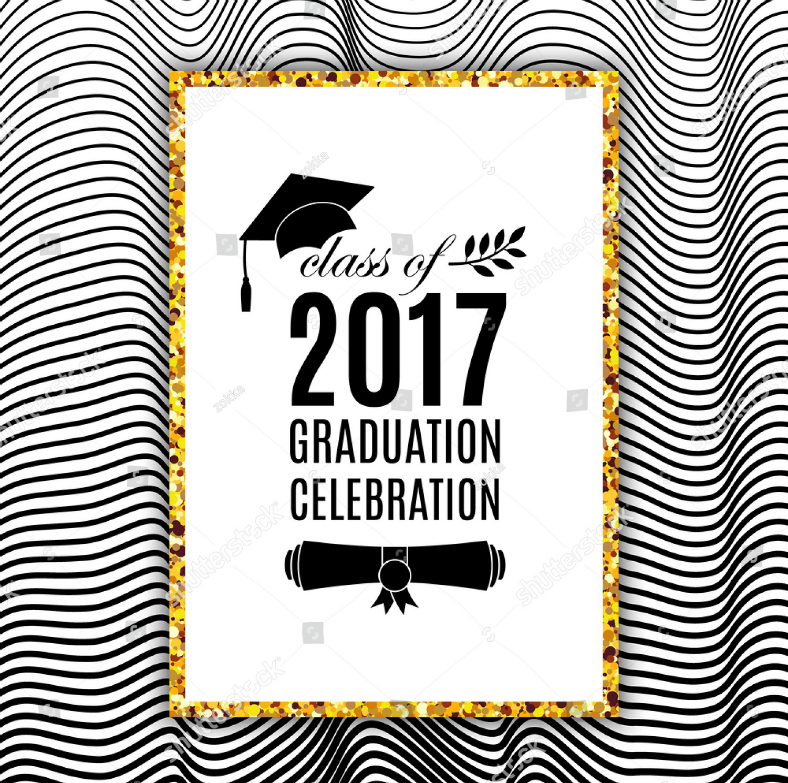 Download this design if you prefer to use a fun and lively looking invitation card for your graduation event. The chalkboard will always be associated with school, even though the use of it has significantly decreased in this generation, and this is because many schools and offices nowadays prefer to use white boards. 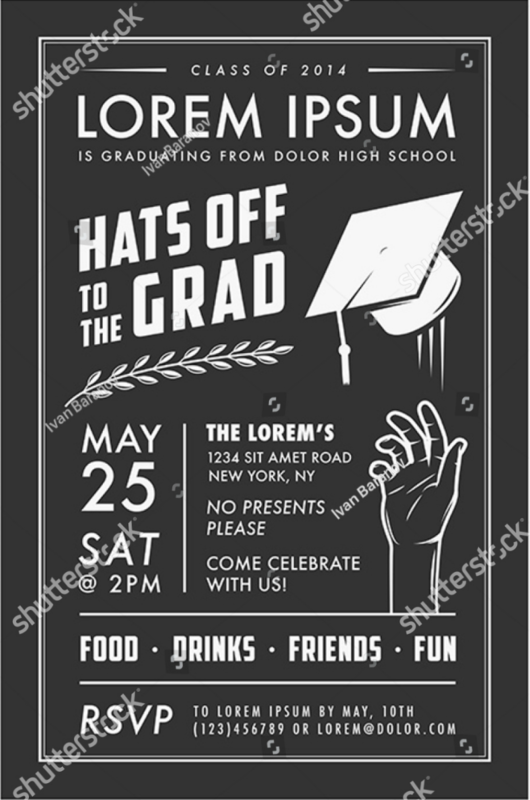 On this graduation invitation design, the text and illustrations appear like they were written and drawn using a chalk, and the backdrop of the design have a chalkboard-like appearance as evidenced by the uneven white shadings on the solid black background. 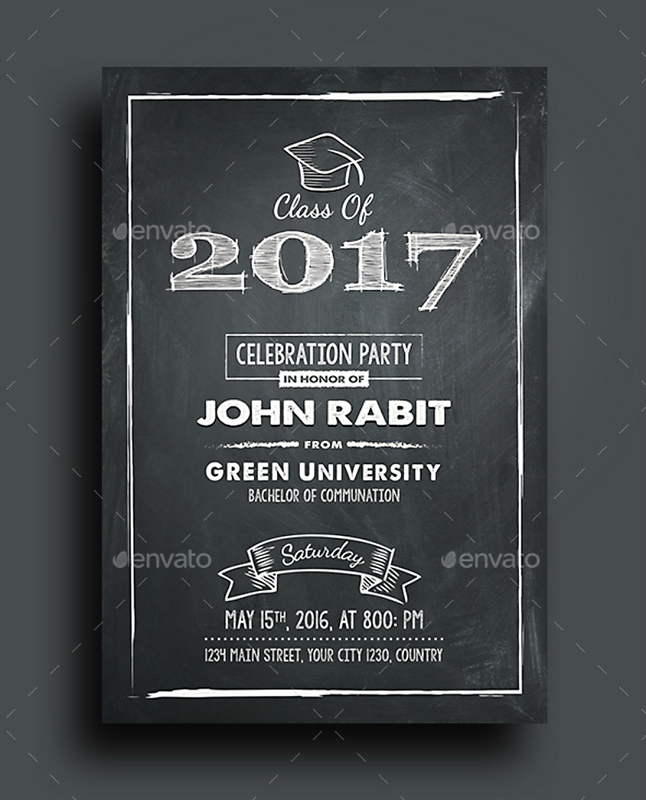 If you think this chalkboard-inspired invitation design makes you recall those wonderful memories of your life as a student, then why don’t you download this design and use it for your invitations? From the invitation card samples that you have just seen, you may think that those designs are expensive to download, but they’re actually not. 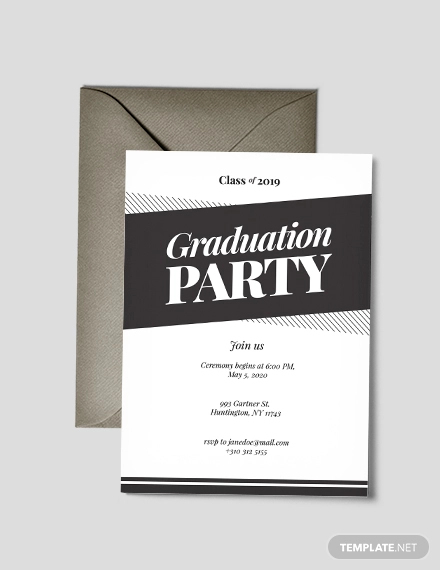 These graduation invitation design can be yours for a very reasonable fee, and they are also very easy to download, which makes them all the more worth downloading. These designs have been gathered from multiple websites and they were also created by imaginative and skillful graphic artists from all over the world. We made sure that we will only be offering you with the best designs so that even for the small amount that you are will be paying, you will be getting high-quality and professional-grade invitation card designs for your graduation event. As for the quality of these designs, these are all in vector format, which are a lot sharper than raster graphics and are also fully editable. With vectors, they are much easier to edit since it allows you to individualize each element and edit them without affecting the rest of the design. And also, with vectors, you also have the freedom to resize any element on the design without risking its quality. Enough with all the talk, now it’s time for action. 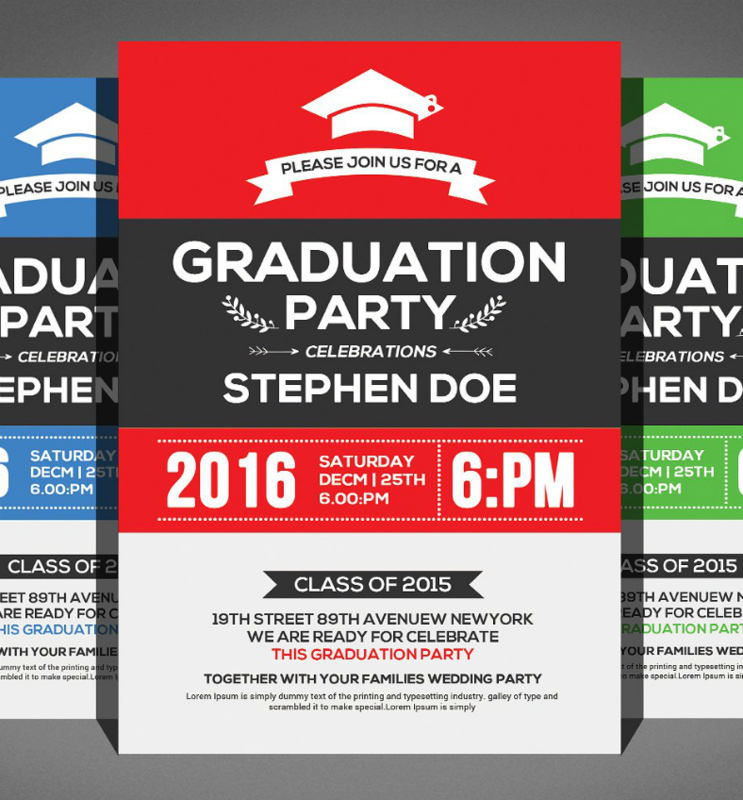 Download a graduation invitation card design now so you can start making for your own event.